I went online early this morning and looked up antique Princess phones, noting the color options. The one I have (left behind by my grandmother) is ivory, but they also came in pastel shades of pink, blue, and turquoise, as well as white, black, yellow, and red. I put in my usual work day, then got to the Studio around 4:30. After looking at my progress from yesterday, I decided to make a few small adjustments to the first prooof. I put a pastel turquoise color over the ivory I had colored the phone yesterday. This not only added a bit of color to that area, but it balanced out that green on the stuffed animal, so the latter no longer seems out of place. I darkened the tabletop with a wash of sepia and black, and decided that the print is done. I went ahead and taped down my other proof of this print to the board, but I'll save the coloring for another time. I left the Studio around 6 pm, and stopped by the Belmar Arts Council to attend an interest meeting regarding a plan to have a summer co-op gallery in our building. Lots to be worked out, so there will be another meeting next week. I'm not sure yet if I'm going to participate, but I plan to go to the next meeting. Meanwhile, I volunteered to gallery sit there tomorrow, during some of the open hours we're having for people to see the current photography show. After work today I put in a few hours at the Studio, starting the coloring of the new Thecla print. My preparations actually began last night, with a search for color combinations for a girl's bedroom. Started by looking through piles of furniture store circulars, but with none of those working for me, I went to the internet and found some good references. Today I started with taping one of my new proofs to the board, and mixing some watercolor samples on scrap paper. When I was ready to start on the print, I began with the light colored table/lamp/phone, then did the pale pink walls in the background. I put a light purple wash on the bedspread, and the floor was a mix of white and alizarin crimson. The bold color of the floor was dominating too much, so I put a heavier layer of light purple on the bed. Along the way I colored the wall artwork, using mostly bits of the same colors found elsewhere. Put in the pink pillows and the green and yellow on the stuffed animal. After considering the results, I slightly darkened the wall color, to help it separate from some of the other lights. What you see above is where I left it. I think it's mostly working, but I'm still considering a few changes. My biggest areas of concern are the table (possibly darkening the table top and putting a different color on the phone) and the stuffed cat (I'm wondering if that bright green is too distracting and too different from all the other colors in the print). I'm planning to return to the Studio tomorrow, and hoping to make the decisions by then. On my way out of town I stopped at the photo store in Belmar to pick up the slides I dropped off a few weeks ago. This is all student work from this past spring. Held up to the light they look good. Since I don't need them before the fall, it may be a while before I get around to projecting them. I spent a few productive hours in the Studio this afternoon. As I expected, finishing the cutting of the new block didn't take long- maybe 20 minutes to finish the pillows, stuffed animal, lamp, and the picture on the wall. Next I tore down a couple of sheets of paper (Rives Lightweight) to the proper size. 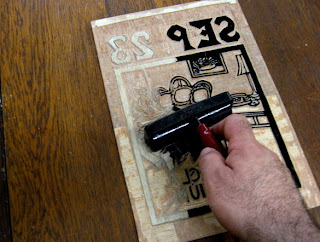 Then I inked the block (see second image above), and printed a proof. That one looked good, so I printed a second copy. Hung them up to dry. Sometime during the coming week I'll start the coloring. Today's mail included a prospectus for a juried show at the Arts Guild of Rahway, open to people who live or work in Union County. I fall into the latter group. I've seen the space before. It's a nice old converted building. I have considered submitting a proposal for an exhibition there, so maybe entering this show would be a nice introduction of my work to the space. The slides aren't due until the end of July, so I have time to consider it. One of the things that came up in the interview Tuesday was something I've been saying for years- the business part of being an artist can often take up more time than the creative part. Making the art is fun, but if anyone else is ever going to see it, you have to do everything involved in seeking shows. I have addressed that stuff from time to time and will do so in the future. Today I did nothing of my own art, but I dealt with art related stuff. While at my sub job I got two phone calls within a few minutes of each other. First was Molly, letting me know she was on her way up to the Printmaking Council to deliver her print for Process show. She had opted to just go with my directions and not invite me along for the ride, which was just as well as I was at work anyway. Then a few minutes later my cell rang again, this time a non-profit art space requesting to send a prospectus for an upcoming juried show. Sure, go ahead. 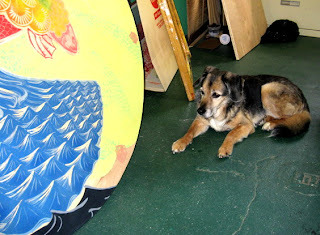 When my shift was near its end I decided to call up to the Print Council, to see if Molly had made it there yet, or if not, to make sure they knew she was coming. Matt told me she had come and gone (I guess my directions worked) and now all the work for the Process Exposed show has arrived. Now Matt just has to figure out how to get it all up on the walls in some logical and aesthetically pleasing way. I'll see the results in a few weeks. Before going home I dropped by the Studio. Not to work on art, but to use the miter saw I have stashed there to cut some lumber for the back stairs of my house. Fixing those will be another project for the weekend. I also picked up some of the framed stuff I brought in for the photo shoot. I was pleased to find that (probably in preparation for the holiday weekend) they finally finished the paving project that has closed lanes for the past year on the section of route 71 that passes the building. I would have picked up some slides (student work) on my way home, but they were already closed for the day. Okay, none of this was very exciting (except for the completed road repairs), but it all needed to be done, even if most of it was not for my direct benefit. Next time I get to the Studio, it's back to making art. Today was probably the earliest I've ever gotten into the Studio, before 9:30 am, to get ready for my 10 am meeting. Things got going a little sooner than expected, but between last night's cleaning and my efforts this morning, the Studio was looking good in time for the photo shoot, as you can see in the top photo above. I'll save the story of all that until after the article runs. You'll see it all here. I walked over to the restaurant/market in Asbury where Molly was working to give her an update and got some takeout lunch. 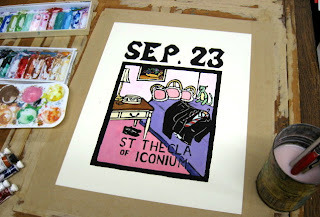 I stuck around the studio for a few hours after, continuing work on the St Thecla block. I'm close to finished, and probably would have stayed a little longer to finish it, but I had to pick up my lawnmower from the hardware store that had tuned it up, and mow my lawn. I expect to be done with the block before the weekend is out. First, I put in a full day at my substitute job. After that, I swung by the Studio to find Molly in there doing some cleaning and working on her latest print, the one she's intending for the Process Exposed show. 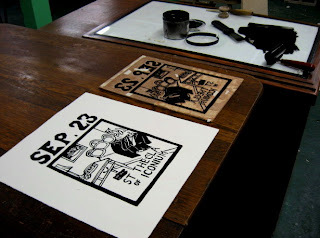 Today she did a rosin aquatint on the two copper plates and etched them in the ferric chloride tank. So far so good. While I was still there, we had some visitors- a couple who run a local gallery who are familiar with Molly's work and are very interested in having her work in their space. Looks promising for her, and I exchanged information with our visitors, allowing the possibility of showing them some of my work in the near future. While this was going on, I did a little organizing of my personal corner of the Studio, and pulled out my display racks. I made a trip home and brought back a bunch of large, unframed prints to show tomorrow. My plan is to get there early tomorrow to do the actual set up, as well as bring more prints and supplementary materials. Better get to bed a little earlier than usual tonight. The early part of the afternoon included some time helping to settle a few questions for one of the artists in the upcoming Process Exposed show. I think it's all worked out now. 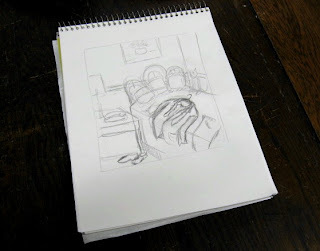 Before leaving the house I laid a suit on a bed, just like I planned for the new block, and did some sketches. Late in the afternoon I got into the Studio. First order of business was finishing the block drawing. I drew that suit on the bed, redrew the phone and lamp on the table and the stuffed animal, relocated and drew the art on the wall. I added some men's shoes on the floor. I decided to go with paint on the wall instead of patterned wallpaper. The simpler design will help it fit in better with the rest of the series. Then came some cutting. Did the border first as usual. I cut parts of different sections, so that I could leave lots of different areas to demonstrate cutting for Tuesday. It's possible that I may do a little more cutting tomorrow after work, but more likely I just use the time to get the Studio cleaned up and ready. I picked up where I left off yesterday. 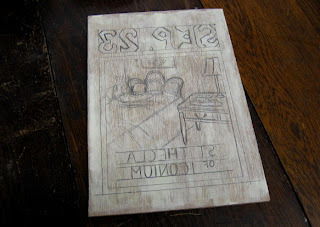 I sanded my block to get a smooth surface, laid out the image border and put in the date and saint name. Then I set it aside. I was generally satisfied with the composition, so I went back to the block. I want to have the image in the same orientation as the first sketch, so I reversed it on the block. The one thing I didn't really work out yet on the block is the suit. 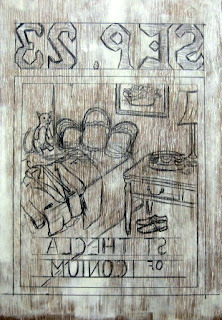 My paper sketch was just out of my head, and I wanted to look at the genuine article before I finish the block drawing. I'll do that at home sometime between now and when I go back to the Studio tomorrow. I went into the Studio for a little while this afternoon to take care of a few things related to next week. 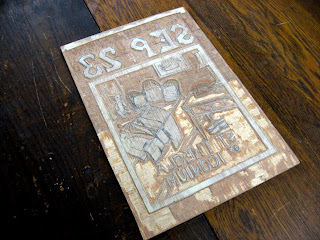 One of the tasks was to print a proof of my St Budoc block. This is in case they want me to demonstrate my coloring technique- it's best to do it with a print that has dried for at least a few days. It should be fine by Tuesday. 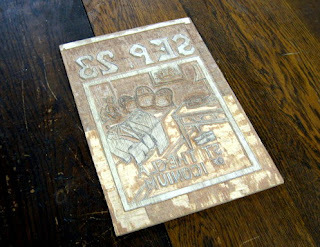 The other thing was to prepare a piece of wood for a new Everyman print. 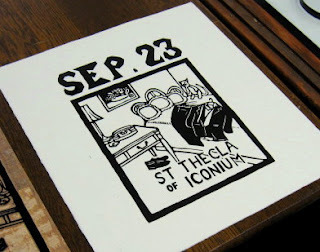 The next saint is going to be Thecla of Iconium. Actually, this relates to St Budoc in a way. I made the Budoc print partly as a wedding present for a recently wed couple that have come up in this blog from time to time. But back a few years, before the bride was officially engaged, she was a fellow professor at my State U, and I showed her examples of prints from the series. Somewhere in that time she brought up St Thecla as having an odd story that she remembered. I noted it for the future. 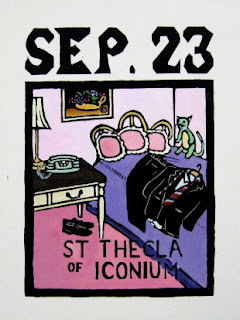 Looking for a print to do now, I recently went through the index of my Butler's set, and found 3 St Theclas. It turned out that the one I wanted was from September 23, a date I haven't done yet. That changes now. The book's author/editors do often cast doubts on some of the sensational stories that typically are part of the biographies of the early century saints, and do so here, going so far as to say she may not have existed. Part of this is due to her story coming from a popular but apocryphal book written by someone discredited by the church in his own time. However, if it's in Butler's, it is eligible for my series. As the story goes, Thecla is a young woman when she is converted by St Paul, which causes family, friends, and authorities to try any and all things to either change her mind or kill her. She miraculously escapes from a number of dangerous situations, rejoins Paul for a while, then retired to isolation in a cave for the next 72 years. The part of the story that had interested my friend is that when she was back travelling with Paul, she was dressed as a boy. Why is she a transvestite? Is it a disguise for a fugitive? An attempt to avoid the scandal that might come with travelling with a man she wasn't married to? To make her more credible as a preacher? The book doesn't say, and it's not important for my print. So far there's nothing to show here. No sketches yet, just some notes as to what I intend to do. All I did today was cut the piece of wood and surface it with wood filler. If you want to see what that looks like, you can look in the February archives of this blog, or go directly to this past entry. I got up to the Studio for a little while in the afternoon. I noticed Molly's car in the parking lot, and when I got to the basement, saw the door open and heard the radio. Inside I found the lights were off, and eventually noticed her dog Barney, but no Molly. Knowing that she's planning a photo etching for the upcoming Process Exposed show, I decided to leave the lights off for a few minutes, in case there was some exposed plate somewhere. 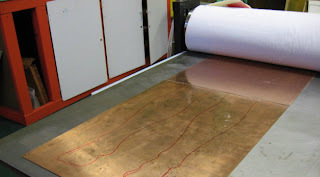 When she turned up a few minutes later she had the photo sensitive materials with her, a film cut to fit on two copper plates (including the leg drawing plate from over the weekend), which she then ran through her press to firmly adhere it. She took these back out of the room again and to the kitchen, where she exposed them and developed them. This allowed me to turn the lights on and get some work done. 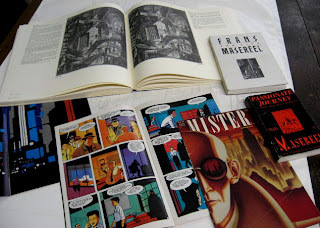 I had brought with me today some reference material shown above- a catalogue raisonne of Piranesi etchings, some Frans Masereel novels, and Los Bros Hernandez issues of Mister X. All these relate to the tower project. Didn't actually get much sketching done today- more like looking at the sources, thinking about how they might influence the drawing. I like the progress of this tower project, but there's no way I'm going to have something ready for next week, so I've decided to start something a bit smaller- a new saint. I have one in mind (I'll give the details next time), but the first step is to prepare a piece of wood. I had planned to do that today, but Barney's presence caused me to postpone that- I was afraid he might be sensitive to the noise made by the electric saw. On the way home I stopped at my usual supermarket to pick up some milk and bakery rolls. Took my items to the express line, and the cashier rang me up. As I was removing 3 bucks from my wallet there was a sudden commotion next to me. Two middle aged women had arrived. One put her stuff down on the conveyer belt, then the other one came up and grabbed the first woman and shoved her back in the line. Then the second woman put her items down right on the scanner and told the first woman, "I'm going first, cause I have cash and you're using a card." She called her by name (Phyllis maybe?) so I guess they were friends. The conflict didn't go any further than that, but still a bit more than I expected. I took my items and left. Before I got to my truck, I saw the cash customer leave and walk toward another part of the parking lot. As I was pulling out of my space, I saw the card customer leave the store and walk to a different part of the lot. Is this a print? Like with the recent dead body thing, it has similarities to stories I've already done. For #15 I dealt with an extremely violent argument between two women (which I turned into a professional wrestling match), and #20 involved a man who shoved ahead of me in line. I'll give it some thought, see if I come up with something new enough to become part of the series. Found this in my mailbox today, the postcard for the upcoming curated show at the Printmaking Council. (my parents, also on the mailing list, got it last week, but things seem to take a little longer to get down the shore) It got a little smeared in transit, but you can read the names very clearly. Out of the 11 artists, 9 are people I recruited- people I work with, share Studio space with, went to school with, exhibited with, or have friends in common with. So I'm hoping it turns out to be a good show- otherwise I have to take some of the blame. It goes up late next week, with the reception coming up Saturday, June 9, 1-4 pm. Although the artists are from all over, several may be turning up at the reception. I expect to be there as well, and I'll post photos from the event here. A busy day today, with Mother's Day stuff, and helping my brother bring a load of furniture and stuff from his storage unit to his new house. But when that was done, I went directly to the Studio for a few hours. I added a couple of layers to the latest version of my tower sketch, so that this one has now grown a little taller than the first. Still have a ways to go, quite a bit to figure out, but I feel like I have a little better idea of what I'm doing. Some of the recent improvements have been in the transitions from one section to another. These are important in creating relationships and flows between the radically different pieces, complicated further by the plan to color the image. It's a lot more work doing one of these large complex compostions, but the results I've gotten from past ones shows that it's worth the effort. This morning I e-mailed the final grades for my two classes at the community college to the school's computer. I may hear from a student or two questioning the grades they received, but otherwise I'm now officially done with the spring semester. That means I should get into the Studio a lot more often over the next few months. But that doesn't mean I'm not going to see any more students. Today my Studio partner Molly had a few of her community college students in for a visit, a demonstration of printmaking, and a quick walk into Asbury Park to check out some local establishments that have her work on display. She has made the same offer to her whole spring art history class, so we may have more taking her up on it over the summer. No problem- we like visitors. Once the kids had left, we both settled down to work for a while. 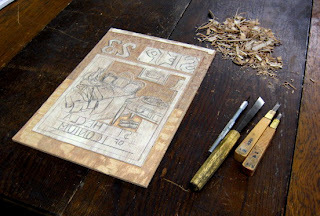 Molly was cutting her latest commissioned woodblock tabletop, while I was back working on my tower drawing. I brought with me another large piece of paper and started over. Some of what I got to today is very similar to what I had in the first sketch, but a little more thought out. Some has changed considerably. Still a long way to go, which makes me think I'm going to have to get another smaller, simpler piece going next week to have something ready for the photo shoot. As I was about to leave Molly asked if I could help her with "an unusual favor". Those are my favorite kind. This one turned out to be having me trace her legs onto an etching plate. She put a copper plate (about 18" long) on the floor of the studio, then sat next to it, draping her bare legs and feet over the length of it. I used a red marker to do the tracing. 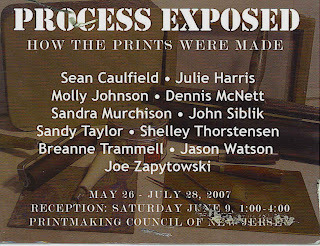 She was pleased with the results (there's a photo of it up top, on the press bed), which will eventually form part of her contribution to the Process Exposed show at PCNJ. My skill at this is no accident, as it's not the first time someone has asked me to do this. Back in the midwest, fellow grad Kendra had me trace her whole upper body for a piece that was destined for her MFA show. My brother officially took possession of his new house today, and to celebrate, I volunteered to bring his mattress up there for him in the back of my truck. However, there was a few hours to kill between the end of my workday and when he'd be done with his, and the Studio is much closer to where I was and would be going than my house, so I decided to put in more time with my large tower drawing. For what it's worth, I may have advanced it another level-- I like what I did today, but now I'm less confindent about some of the earlier stuff. Or maybe I'm still just concerned about how I'm going to squeeze everything in. Or maybe I'm not sure if the idea is coming across clearly enough. (just what that idea is will be revealed when I'm ready to go to the wood) I'll give it some thought over the next few days, as doing my final grades will keep me too busy to get to the Studio for a little while. That will also give me time to track down some of my intended reference sources. I was able to get into the Studio for a few hours each yesterday and today. The first day's work included the item shown above, a drawing that combines all the various sketched fragments of that bit of church architecture I mentioned previously, what my mother sometimes calls "the celestial elevator". You can see why this thing fascinated me so much when I was a kid. This drawing can serve as the reference when I'm working on the later larger drawing on the block. Also on Saturday I started working on some of the tower breakdowns in a 9"x12" sketchbook, but it was too small at that scale to show any detail. Today I cut a large piece of cheap paper off a roll so I could start working it out in full size scale. I got as far today as I got yesterday, but this time I could do some crude sketches of the scenes/architecture within. That still leaves a long way to go, but I have a lot to still figure out anyway. The celestial elevator is only one small piece, a tiny fraction of the whole composition. There's so much I want to put into this thing, but it's not all going to fit the way things are going. Now's the time to figure out what stays, and what goes. The end of the semester that is. Today I had my first last class of the semester. Three more to go next week and then after I finish the grades I'm done for the spring. Lots more to keep me busy. My schedule this fall had me teaching until after 9pm down in Toms River on Thursdays, then with an early class in North Jersey on Fridays. Northbound traffic being what it is around here, I'd drive directly to Bloomfield each Thursday night, to make my commute a much shorter, less dense southbound commute. Did this last night as usual one last time. I took advantage of being in Bloomfield in the early morning to attend the 7:30am mass at St Thomas the Apostle, my old home parish. After the mass I hung around to do a little sketching. The church has been considerably remodeled since my youth, but some things don't change and those were the things I wanted images of. 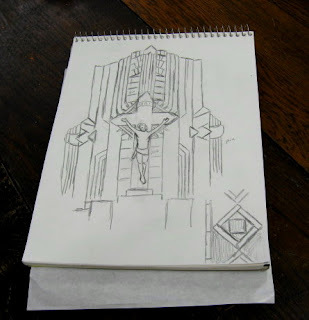 My main subject today was the large floor to ceiling art deco-ish back wall piece of sculpture/architecture on which hangs the crucifix, but I also did quick sketches of the marble floor patterns and the light fixtures. Couldn't stay too long as I had to get my stuff and get down to my 9:30am class. Why the church sketches? It relates to the project involving the Tower of Babel painting and the erector set. As for how it fits together, you'll all have to wait a little long to find out that. Yesterday's paper had the latest news on the most recent dead passenger in a supermarket parking lot. Now the police suspect that it's a suicide, based on many things going on in the guy's life. Actual cause of death is still undetermined. I'm still going to wait a little longer before deciding if there's a print to come out of this incident. While I was still at school I settled another little bit of business. Just before leaving for class last night I made a last e-mail check and found one from the main regional daily newspaper. They have a series of articles about local artists that runs in the Sunday entertainment section and want to do one about me. 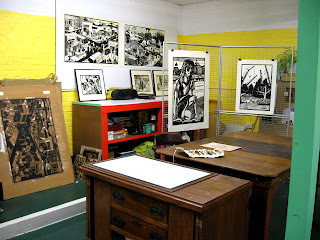 I'll be interviewed in the Studio, while they take photos of me working and some of my art. Kind of a surprise because I didn't have much to do with this- an image I sent with a press release for my show at Landmark Books last summer made an impression, followed up recently with visits to my website. I left a quick phone message with the writer letting her know my interest before dashing off. She called me today on my cell and we set plans to meet in a few weeks. This gives me time to get a new project started for the event, as well as get the Studio cleaned up. I'll provide more specific details later.